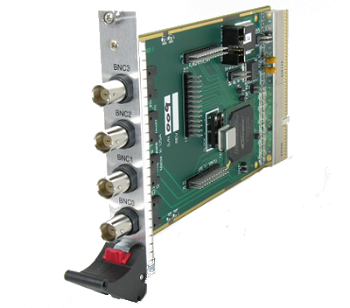 PulseBlasterESR-PRO-cPCI TM is a high-speed, programmable, multichannel pulse generator in the CompactPCI form factor. The PulseBlasterESR-PRO-cPCI offers up to 24 independently controlled channels, variable output rates, up to 4096 instruction words, and powerful program-flow features. PulseBlasterESR-PRO-cPCI can accommodate pulse programs with highly flexible control commands of up to 4k program words, featuring loops (nested 8 levels deep), large loop counter (20 bits, up to 1,048,576 repetitions), and deterministic WAIT opcode with user-programmable latency and high retriggering frequency. Currently available clock frequencies are up to 200 MHz. (200 MHz clock frequency, 5 ns shortest pulse (with Short Pulse Feature), 4k memory depth).